Find your perfect pair with the Kitchen Combination, featuring one of our favourite faucets matched with a best-selling sink. The Nola Pull-Down Faucet features an ergonomic dual-function sprayhead and top-quality components for maximum durability. The KBU14 31 " Single Bowl Sink is made with premium 16G T-304 stainless steel, and fully soundproofed with NoiseDefend technology. This combo comes with a matching soap dispenser. Experience Kraus Quality, and outfit your kitchen in style. The BLANCO ARTONA collection has a sculptural design, beautifully suited for contemporary and transitional kitchens. This collection includes a main kitchen faucet, bar/prep faucet and soap dispenser. The ARTONA comes in a wide range of finish options designed to perfectly match BLANCO SILGRANIT. and Stainless Steel sinks. Pull down, single pole spray faucet, finished in Chrome. Faucet features brass and polymer construction, easy to change out ceramic disc cartridge, backflow prevention, and dual spray/stream flow. Spray head extends to 16. Certified by cUPC<sup></sup>. Lifetime mechanical warranty, and Lifetime warranty on Chrome finish. Pro style pull down stainless steel faucet with smooth, single handle operation, flexible spray head, and swivel. Faucet features dual function aerated stream and spray flow, easy to change ceramic disc valve, water saver rated at 2.2 USGPM. Unique, sculptural, hard working and practical for the serious home chef! Graceful in stature, Etch faucets give you the jewel to elevate the look of your transitional kitchen. Facets adorn just the right places on the handle, base and spout, creating a feel that's distinctively glamorous. The pull-down design offers at-your-fingertips water delivery. 31.5 Inch. 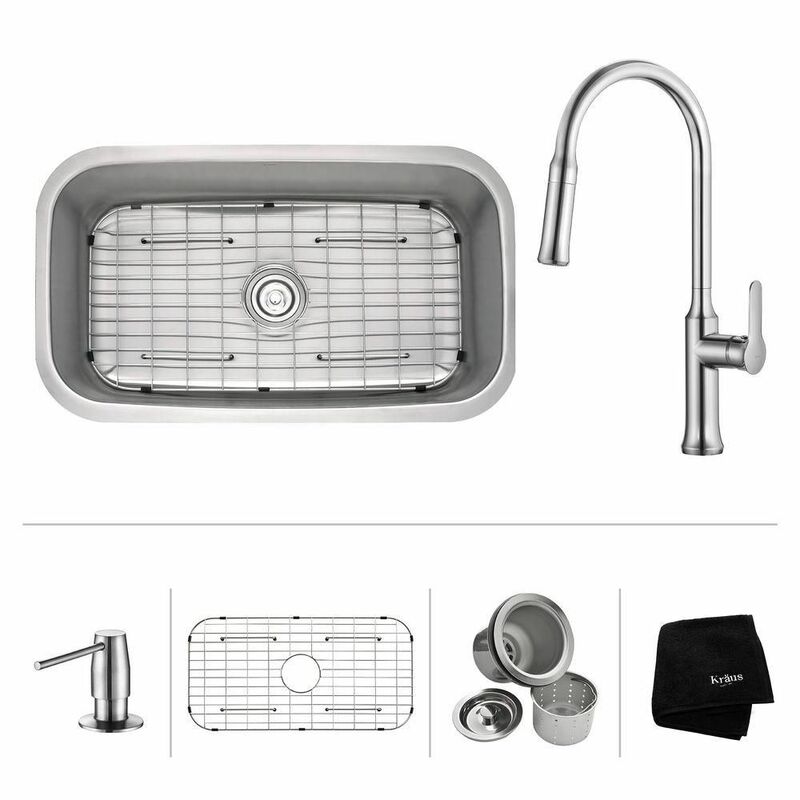 Undermount Single Bowl SS Sink W Pull Down Faucet & SD Chrome Find your perfect pair with the Kitchen Combination, featuring one of our favourite faucets matched with a best-selling sink. The Nola Pull-Down Faucet features an ergonomic dual-function sprayhead and top-quality components for maximum durability. The KBU14 31 " Single Bowl Sink is made with premium 16G T-304 stainless steel, and fully soundproofed with NoiseDefend technology. This combo comes with a matching soap dispenser. Experience Kraus Quality, and outfit your kitchen in style. 31.5 Inch. Undermount Single Bowl SS Sink W Pull Down Faucet & SD Chrome is rated 4.0 out of 5 by 1. Rated 4 out of 5 by Cisco from Excellent appearance! Good Quality product for the price.... Excellent appearance! Good Quality product for the price.